Website best viewed on Mozilla Firefox and Apple Safari. More people are writing and reading emails on the iPhone and iPad today than ever before due to its ever growing popularity. It is no wonder why since it is so easy and convenient to use. The Mail.app on the iPhone and iPad is very similar to the version running on Macs. The Mail.app on iOS can render HTML signatures very well even when designed with remote HTML images but Apple has not provided a simple way to install HTML signatures onto the iPhone/iPad. Create an email signature design with HTML that matches your brand. Use MYDESIGNPAD’s Email Signature Service if you need help with design and HTML. 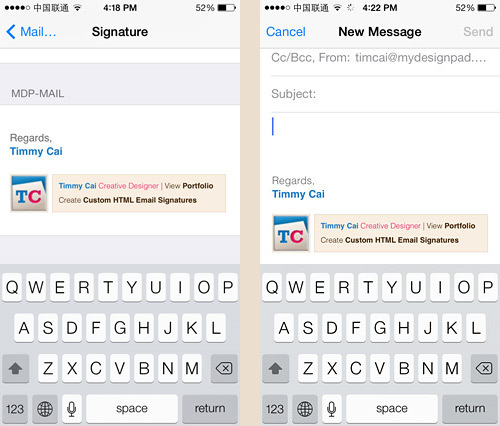 Install the HTML email signature properly on your iPhone/iPad with the Quick Signature.app available on the App Store for $1.99 per download. Please use at your own risk. MYDESIGNPAD is not associated with this app and it’s owner in any way. 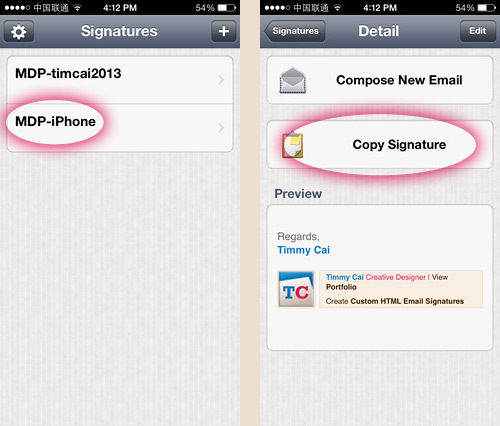 Follow the install instructions below after downloading the Quick Signature.app on your iPhone or iPad. 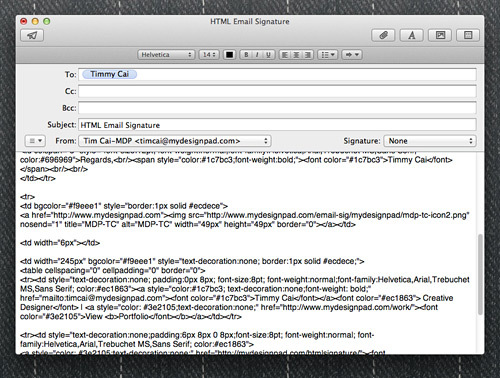 Open your HTML email signature file with Safari. 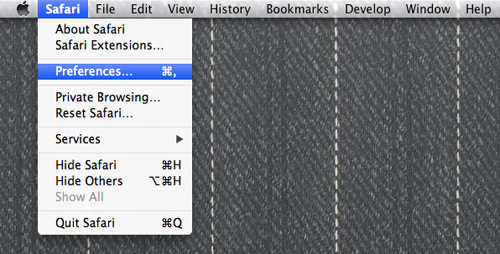 Go to Safari/Develop/View Page Source to reveal HTML code under the design. Select all of the HTML code and copy. 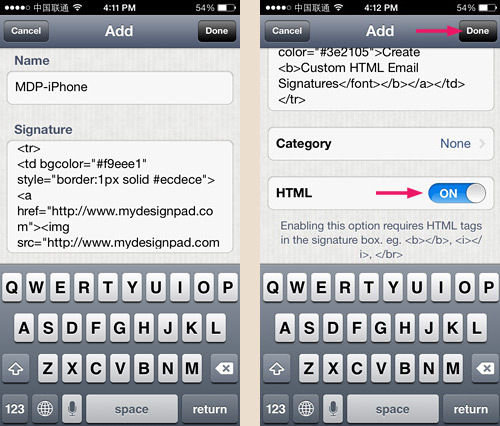 STEP 2: Email HTML Code to Your iPhone/iPad Inbox. Paste the HTML code in a new email message window. Make sure only the HTML code is in the email. Nothing else. 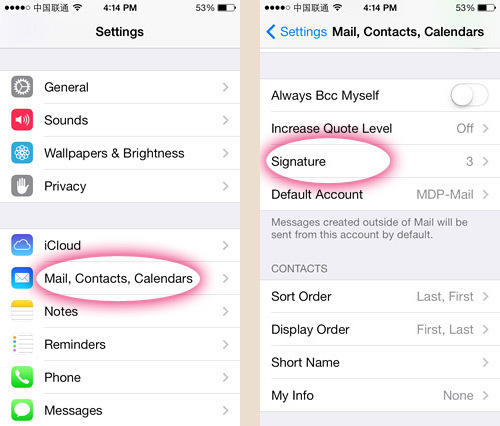 Email message to an email account installed on your iPhone/iPad. Refresh your inbox on your iPhone/iPad to get new messages. Open message that you just sent to yourself. 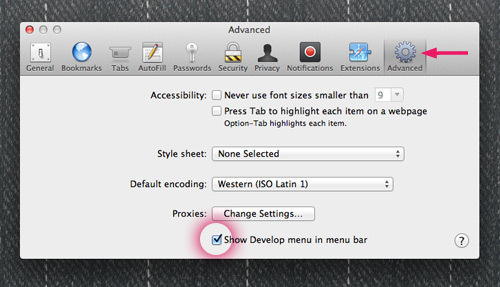 Create a new signature by pressing the “+” icon on the upper right. On the “Name” area, give your new signature a name. On the “Signature” area below “Name,” paste the HTML code that you copied. Press “Done” on the upper right to go back to the “Signatures” panel. Select your signature to open the “Detail” panel. 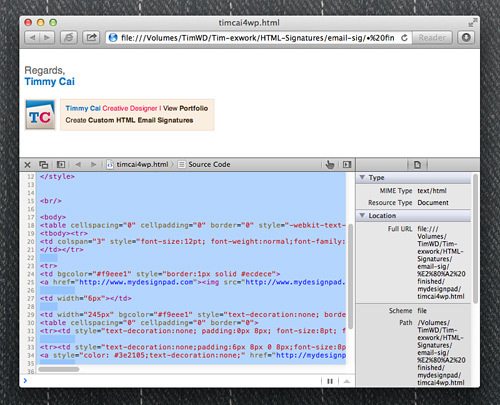 You will see your HTML email signature design in the “Preview” window. 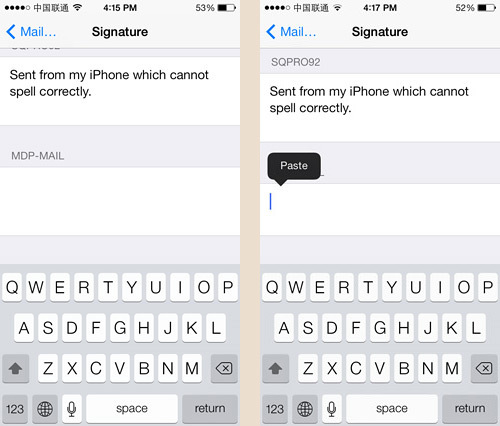 Press “Copy Signature.” Then press the iPhone/iPad “Home” button to go back to the main screen. Scroll down to the signature preview window for your email account. 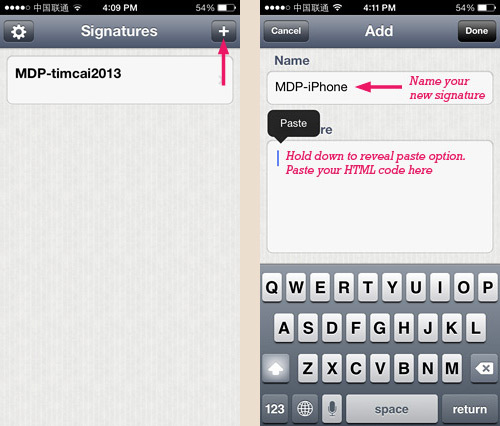 Paste the HTML email signature that you copied in STEP 4. That Is It! Go on with Mail as usual. Happy email writing. Is there a way to get the image in the signature not to appear as an attachment? When using an image in my signature even with coding in html there is an attachment paperclip that shows up on the iPad for that email. The email signature displays fine but this could be a bother to people that sort their mail by attachments. I bought the app for my IPad signature. And all I wanted to do is put my company logo under my signature, and it won’t let me. Great tutorials! I’m not a computer person at all, but these were great! I love how my email signature turned out – you’re an awesome teacher! Make sure that you image is hosted remotely on a web server. I followed instructions and it works great except that I am getting duplicate signatures- any ideas? I have redone process several times to no avail. Leave a comment * Required fields. "Sure someone else could have created a greater logo redesign for EME Lighting but I was sold on Tim’s diligence & reliability plus I love our new logo! It is fresh, symbolic of who we are while staying in line with our brand intention." "Tim is a trustworthy and effective designer. He redesigned the entire visual identity system for my company & I am extremely pleased with it. As the CEO of a company with over 3000 employees, I would recommend Timmy to anyone looking to have some serious design work done." "Tim effectively designed my website and newsletter. What impressed me the most was his ability to create the images, style and design I was looking for. I highly recommend him if you are looking for someone reliable, flexible and talented." "Tim has a great personality that makes him a pleasure to work with. He is focused, hard working & always has an attention to details. He has great curiosity and constantly strives to learn & develop himself taking his work to the next level"
"Tim conceptualized original ideas & executed the design brilliantly. He always made sure the highest technical & design standards were met. I could always count on him to translate the client vision into reality." 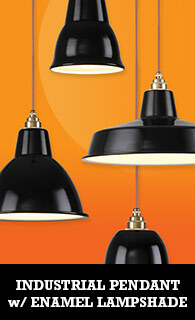 "Tim is a highly talented designer. He has excellent technology skills, amazing dedication & terrific interpersonal abilities." "Timmy is a very talented designer, he is passionate and reliable, his work is always creative & on time. He’s a good person with lots of energy, which makes him a pleasure to work with." "Timmy got a great system for helping you figure out what you want, need & putting those ideas down into a tangible product. He has done 3 sites for me already & anyone I have recommended him to has called me back to thank me."